Burns Drilling Supply, Inc. is your headquarters for the very best in Horizontal Directional Drilling Supplies, Safety Products, Tricone Bits, PDC Bits, Steering Shoes, Hole Openers, Reamers, Trencher Replacement Parts, and much more! Call us with the type of Polycrystalline Diamond Compact(PDC) Reamer that will fit your drilling conditions. Information needed: size, connections, and type of rock. 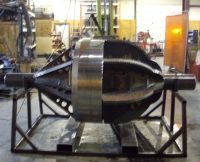 We will custom build your reamer in 3 to 4 days; larger sizes will take an extra day or two. Welcome to Burns Drilling Supply! We supply: Tricone bits, holeopeners, steering shoes, backreamers, drill rod, drill collars, starter rods, sonde housings, rod wipers, swivels, plow blades, fiber optic cable, and any type of cable, cable tooling, HDPE duct, trencher replacement parts, safety products, and much more. Contact us for more information. We will custom build the opener to your specification size from 8" thru 48" with any style connections. We use oil field quality rerun or new bits in our hole openers. Our plow blades are custom built for your particular application and machine. If you have a Ditch Witch, Case, Bron, Delta, Vermeer, etc., or even a discontinued model, we have patterns to build your blade. Just let us know if it is for Cable TV, fiber optic, phone, irrigation, electric, gas, or drainage. All of our blades are made from high alloy tool steel & have proven to last even in extreme ground conditions. Burns Drilling Supply, Inc. takes pride in providing quality bits at a competitive price for all of you drilling projects. For more information, give us a call. All of our drill rod is made from 4100 series chrome-moly steel alloy and made to exacting specifications. If you need integral forged drill, inertia welded drill pipe, small order or large order we can supply. We can also furnish specification sheets of how our rod is manufactured. All of our back reamers are custom built to fit your project. We have a 1 - 3 day turn-around time on most of our orders. Our reamers have proven themselves to last in even the most extreme ground conditions. This is due to the high alloy steel that is used with virgin tungsten carbide teeth and rubble that is used in all or our reamers & bits. We carry a full line of steering shoes, but we can also custom cut to fit you particular needs. All of our shoes are made from a high alloy steel with virgin tungsten carbide teeth and rubble. Contact us for information. Special put-ups and runs available. Multiple colors, parallel, segmented colors; orange, red & black available in SDR 9, 11, 13.5, 15.5, and 17.0. Call us for more information. Our safety department carries safety lights, traffic control signs, aerial safety, personal protection and confined space equipment. Whatever your safety needs, we can ship to your job site. Copyright © 2013 Burns Drilling Supply, Inc. :: Designed by: Burns Drilling Supply, Inc.